Our collection of Storage Equipments is fabricated using advanced technical techniques and quality raw materials of stainless steel. We have in store for our clients a wide assortment store area of the kitchens in hotels and restaurants is an important place as various types of utensils and ingredients are stocked. These are widely used in both residential and commercial purposes. Our range is widely acknowledged for their durability and unique robust designs. These can also be customized as per the requirement of our clients. Dunn age Racks offered by us are widely used in the hotels and restaurants for accommodating a wide range of products. Our range is broadly admired for the high consistency, sturdy construction, corrosion resistant and durable, which is highly appreciated by the clients. These are offered to our esteemed client’s at most comprehensive rate. 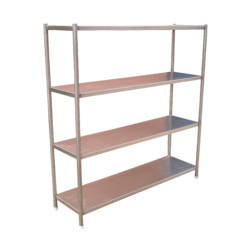 Our extensive experience in the industry qualifies us to produce a highly reliable range of these racks that are made using high quality stainless steel and mild steel material. This Ingredient Bins are used to store several food products like vegetable crispers, packaged items and other ingredients required in cooking, as these are mostly used in the pantry areas of hotels and restaurants. 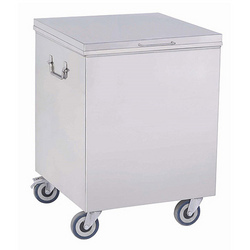 This has specially designed with the attached wheels that help in moving the bins around the kitchen area. We offer these products at cost-effective rates. We supply these products that are made using quality material and by using advanced techniques to design them. Potato Onion Bins are commonly used in different hospitals, restaurants and hotels for storing various potatoes and also other vegetables, where food is prepared in bulk, thus helps in protecting from rodents. 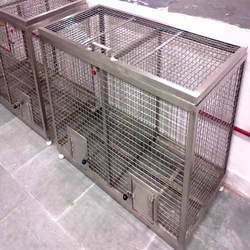 Offered range of this bins are specially fabricated using high quality material of metallic mesh which helps in air flow and helps then not get rotten easily. Our range is highly appreciated for its features and cost effective prices, and can be accessed in various dimensions as per the client’s requirement. We are one of the noticeable foremost manufacturers and suppliers of these Pot Racks in a wide range, which are made using finest quality raw materials gained from dependable dealers of the industry and by using technically advanced machines. This racks are ideal for safe and easy way to keep the utensils, thus it ensures highly beneficial to many households and also too many others in the food industry. These are specially designed as per the international and industrial standards. 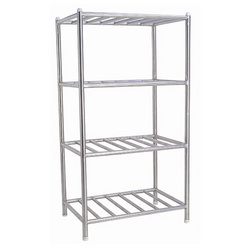 Our organization holds expertise in offering high grade Stainless Steel Storage Rack to our clients, which is well known for the perfect performance, efficiency and long service life features. These racks find application in both household and commercial purposes specially used for storing kitchen utensils. Furthermore, our range finds huge demand in the competitive market as we customize these as per the consumer’s choice. 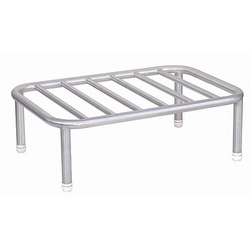 These racks are widely known for its robust, light weight and corrosion resistant. Looking for Food Storage Equipments ?